1. Britain’s Prudential announced plans to buy AIG’s Asia operations for $35.5 billion in cash and stock -- since this is partially a cash deal, it will involve selling British pounds. 2. 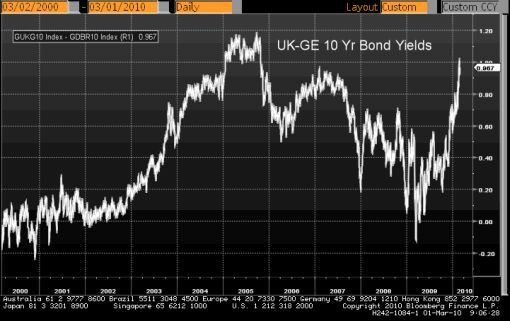 Gilts Losing Luster -- According to the FT, the gap between the U.K. and German interest rate has risen to the highest level since 2005. Even though the official U.K. interest rate is less than the Eurozone’s interest rate, the cost of servicing government borrowing in the U.K. over Germany has increased significantly. 3. BoE Could Raise QE -- Based upon the dovish comments from Bank of England officials at the beginning of last week, there is a tiny risk of the BoE raising the size of their QE program on Thursday. Even if they do not, the tone of their statement will be dovish which is also bearish for the GBP. 4. Short GBP/USD Positions Hit Record Highs -- According to the CFTC Commitment of Traders report published on Friday, short GBP and EUR positions have hit the highest level ever. Forex traders are clearly very bearish pounds and they have good reasons to be with jobless claims at 12 year highs and consumer spending falling by the most since Feb 2009. 5. Stop Orders Tripped, Hedge Fund Selling -- There has also been a lot of chatter about hedgies selling the GBP. There were a ton of stop orders sitting at the previous 9 month low of 1.5117. When the GBP/USD broke that level, the currency pair dropped very quickly. The selling exacerbated when stop orders at the 1.50 level were tripped, but the big move came when the GBP/USD broke below 1.4935 -- it fell 158 pips in 3 minutes. With so many straws on the camel’s back, it was bound to fall under the pressure. A bounce is not out of the question after such a big move particularly since the GBP/USD has not able to rally for the past 9 trading days. However unless the BoE stops talking about QE and we don’t expect them too, the GBP will continue to be the worst performing currency. 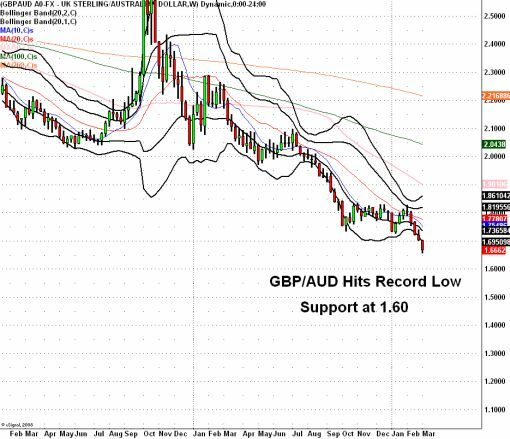 Finally, the GBP/AUD has hit a record low. Last week, I blogged about how shorting GBP/AUD is my favorite trade. At the time it was trading above 1.73 and today it hit a low of 1.6545. Hopefully you managed to bank some solid profits. I still expect it to move lower -- but this is where trailing stops should be implemented to lock in profits.